Patients suffering from periodontal disease often experience chronic bad breath as a result of bacteria and toxins in the mouth. However, there are many different factors that can cause bad breath as well. Whether it is due to illness, oral hygiene, or lifestyle choices, there are many different treatments available. Patients suffering from halitosis in Sacramento, CA can contact Dr. Andrea Joy Smith for treatment options. Patients who consume foods that contain a lot of fish, garlic, onion, or spices may experience bad breath as a result. No matter how thoroughly you brush and floss, the odor of the food will not go away until the meal has been digested completely. This can sometimes take several hours. If you regularly eat these food items, try eliminating them from your diet to see if the problem goes away. Alcohol and tobacco products are commonly associated with bad breath. Just like with food, the scent of alcohol can remain on your breath for hours until it has been processed by your body. Tobacco products can also increase the presence of plaque in your mouth and lead to periodontal disease. It is suggested that you avoid alcohol and tobacco if you suffer from halitosis. Patients who do not brush and floss properly often accumulate plaque and bacteria much more quickly. Even if you brush and floss every day, it is important to get the hard to reach places. We recommend flossing daily and using an electric toothbrush and anti-bacterial mouthwash to combat this build up and help to prevent periodontal disease. If this does not help, contact Dr. Smith to schedule an evaluation. 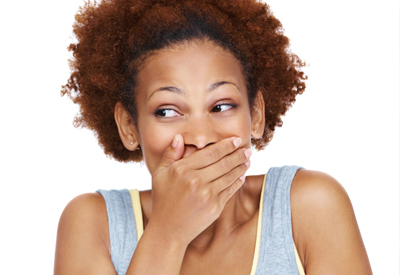 Bad breath is one of the earliest and most telling signs of periodontal disease. Depending on the severity of the infection, treatment can be as simple as a deep cleaning or antibiotic therapy. However, more severe cases may require gum surgery. If you have chronic halitosis, it is important to determine the root cause of this condition. To find out more about the causes and treatments of halitosis in Sacramento, CA, contact the office of Dr. Smith to schedule your consultation today!